Super Savings Item! 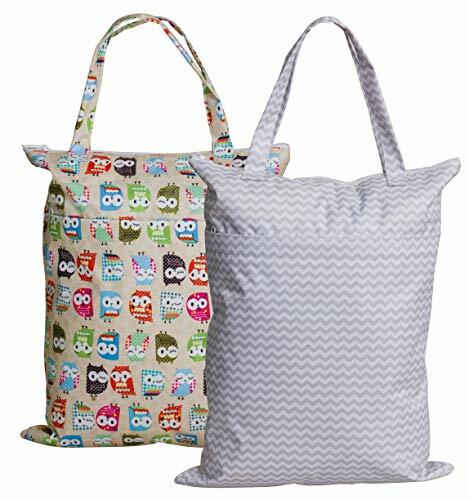 Save 39% on the Large Zippered Hanging Wet Dry Bag with Snap Tote Handle for Reusable Cloth Diapers, Swimsuits, Laundry, Gym (Grey Chevron + Owl) by Sleeping Lamb at My Pregnancy Place. MPN: WB0091-TT. Hurry! Limited time offer. Offer valid only while supplies last. Material： This wet bag for swim suit accessory made of environmetal quality polyester surface and durable waterproof coating, easy to wipe clean. View More In Cloth Diaper Accessories. This wet bag for swim suit accessory made of environmetal quality polyester surface and durable waterproof coating, easy to wipe clean. -Wet dry diaper bag made of waterproof material, it contain the smell pretty well, perfect for carrying wet swimsuits, dirty diapers, towel, soiled clothes. -Very roomy and has two compartments, one for clean, one for dirty. -Reusable bag and machine washable. washed in cold or warm water. -zip it up without worrying about the urine smell getting out into the air or onto the change of clothes that are unused. -Comes with a snap handle, so that you can easily pick the bag up or hang it. -Simple design for traveling, gym, swimming class, luggage, laundry, rv, camp, school, daycare, pool, beach. Washable and foldable gym bag, a best choice for trip, laundry, rv, daycare, pool, beach.